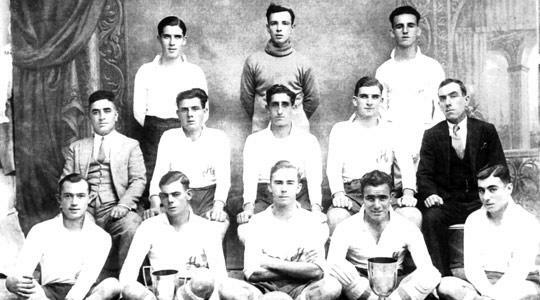 The Constitutions FC 1931-32, soon after they won the Amateur Championship. There are very few people still around who remember how football was played in the 1920s. However, the old-timers who lived through that era will surely agree that the period between the two world wars was dominated by the amateurs. Football was at its best, and the game was spreading rapidly across the islands. In those days, the Maltese did not have much to occupy their spare time and football was their favourite pastime. Many amateur teams were formed during this period. Among these teams one finds the Constitutionals FC, of Paola who, together with Floriana Tigers, Sliema Rovers and the Gioventu Cattolica, dominated amateur football during its golden period. The Constitutionals were formed in 1922 at the local Constitutional Party Club which had its headquarters in the building once occupied by the Traveller's Rest Hotel in Paola Square. Thus, as destiny would have it, the direct forerunners of Hibernians FC were founded in the same place where the legendary Paola Wanderers were born way back in 1896. At the time, the construction of the new parish church of Christ the King was still in the early stages. This small but important building in Paola remained standing up to the late 1950s when it finally made way for the lower belfry tower of the new church. The Constitutionals were formed with the intention of taking part in the newly-formed Amateur League. The initial meeting of this organisation was held on November 27, 1922. In the first sitting of the association, the delegates of the 11 teams, which had applied to take part in the league, were involved in a heated discussion. When the sitting opened, it was proposed that only six teams take part in the league. The motion was successful, with the result that five out of the 11 teams were left out. Among those omitted were the Constitutionals. We do not know the reason why this motion was moved but it is not difficult to see why. There were people present who did not like the idea of having a club representing a political party taking part in the competition. To soften the disappointment of those teams that were left out, the staging of a second competition was proposed. This motion was also passed and the two leagues were started soon afterwards. The Constitutionals entered this second league. After that historic, but somewhat disappointing season, the Constitutionals seemed to lose interest and very little more was heard of them. They did not take part in the Amateur League in 1923-24 and after a while they were probably disbanded. However, despite this initial setback, the Constitutionals did not die a natural death. In 1927, the team was reformed at a general meeting held on October 30. The following persons were present for that historic meeting: W.E. Griffiths, A. Bonello, G. Bajada, A. Formosa, C. Theobald, R. Querolo, W. Leeks, E. Jones, A. Theobald, G. Deguara, F. Busuttil, J. Hawes, G. Vella, G. Bugeja, L. Galea, A. Cawles, G. Vella, L. Xerri, F. Farrugia, R. Graham. Griffiths was elected president and Leeks secretary. Politics and sports have often mixed with usually disastrous results, but in the case of the Constitutionals, this was certainly the exception to the general rule. In the Constitutional Club of Paola, there were in those days several men whose past was invariably connected to the game. Under the direction of Griffiths and A. Bonello, the treasurer and later team manager, and aided by the technical knowledge of that great half-back Querolo, affectionately known as Calolu of St George's fame, a team of enthusiasts was quickly put together. Interest in the team's achievements began to spread in a football-mad district which had for so long been deprived of such pleasure. Training, friendly matches and, above all, enthusiasm soon began to tell. The Constitutionals quickly established themselves as one of the best amateur teams of the era, rivalling the fame of such famous teams as Floriana Ajax and Melita. Pioneers in the early line-ups were the Theobald brothers, Turu and Gużi, the Miller brothers, Victor and Eddie, Joe Hawes, the first skipper, T. Apps and H. Wimshurst. Later on, they were joined by the Edwards brothers, Harry and Johnnie, Leli Gigli Farrugia, J. Scerri, A. Formosa, C. Falzon and the one and only George West, who years before had made a name for himself with Floriana FC. These were the pioneers who gave birth to the present club of Hibs.